Chicken soup is delicious and nutritious and known as an effective treatment for colds and other ailments. If we look at its origins, it can be traced back to the domestication of fowl and the combining of noodles and broth which goes back as far as the 1200’s. 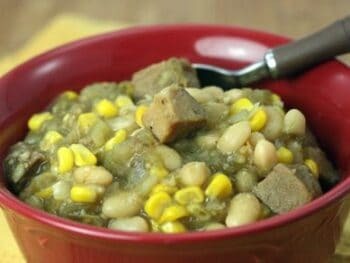 In the 1700’s, it became a popular dish to serve to sick people because it was easy to digest. By the 1900’s it had become a staple of convenience food all over the United States. Campbell’s came out with its Noodle with Chicken Soup in 1934 but when a radio host accidentally called in Chicken Noodle Soup, people went crazy and its fame grew. Although chicken soup is commonly given to the sick, it seems there is a bit more to it than it just being easily digestible when it comes to improving health. It turns out that it has some components that inhibit neutrophil migration which give it an anti-inflammatory effect that can help it ease symptoms of a cold and other illnesses. However, once research was further examined, it was found to be inconclusive for the most part as it is unknown whether these components can really have enough of an effect to make a difference. But whether there is truth behind the healing benefits chicken soup can provide or not, one thing is for sure, it is definitely nutritious and delicious. Chicken is a great source of protein and other vitamins while carrots and other vegetables that maybe added are also extremely healthy. 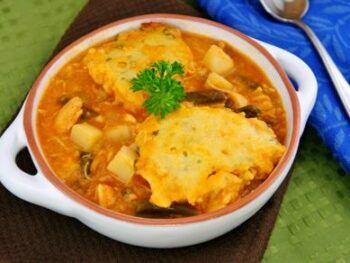 Chicken soup is also generally a low fat, low calorie soup. 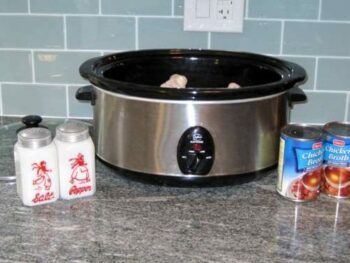 When we think of ways to prepare chicken soup, the crock pot may be one of the best. All you have to do is add the ingredients in the morning and then look forward to the delicious aroma of soup wafting through the house and a nice, home cooked meal. 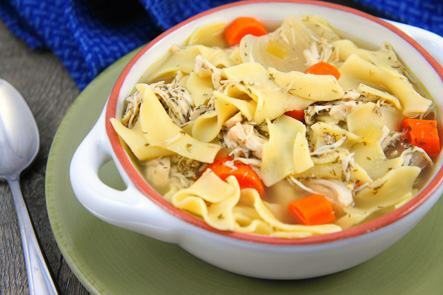 Chicken soup is good for the soul, and this crock pot chicken noodle soup recipe is soul satisfyingly delicious! 1. Put carrots, onion, and celery into crock pot. 2. Add the chicken, then pour in the broth and water. Sprinkle parsley, dill, and garlic on top. 3. Cover and cook on low 6 – 8 hours. 3. Remove chicken and vegetables from crock pot, add noodles and turn to high. 5. Return vegetables and chicken to the crock pot for an additional 20 minutes.